Fire station #30, the first fire station manned by African Americans in the West, was established in 1924. 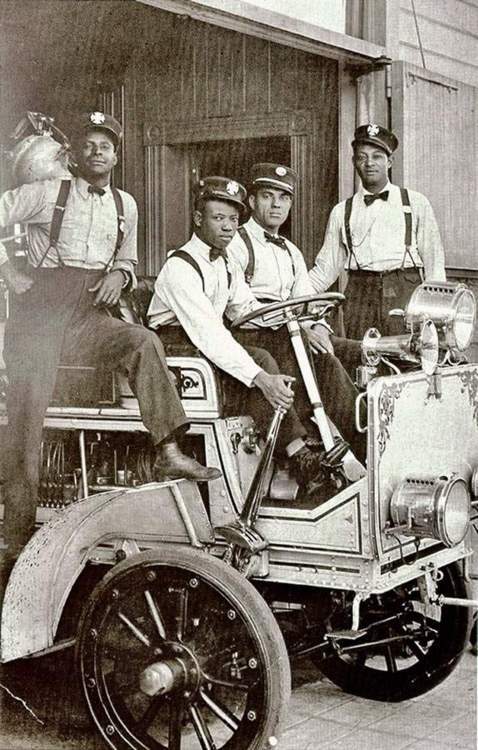 Although the station was created in 1924, African Americans had been serving as firefighters in Los Angeles, California for decades, with Sam Haskins becoming the first Los Angeles fireman of African descent in 1892. In 1902 all the African American firemen were segregated to Hose Company #4, located on Loma Drive near Beverly Blvd. Fire station #30 was created as an all African American station because of a fire that destroyed Belmont High School. The school was rebuilt in 1924 right across the street from Hose Company #4, and the school’s administration and teachers, the Los Angeles School District, and local white residents did not want African Americans as firefighters and thus, in positions of authority, near their children. As a solution, all of the city’s African American firefighters were relocated. Fire station #30 was situated at 1401 Central Avenue, an area that was emerging as the city’s black community because of racially restrictive covenants and because most African American newcomers to the city settled in the neighborhood. The white firefighters who were forced to be relocated so station #30 could be used by African American firefighters trashed the firehouse kitchen in protest. They were ordered, however, to clean up the kitchen upon orders of Los Angeles Fire Chief, Ralph J. Scott, who also gave them a stern lecture. As a result of the 1954 Supreme Court case Brown vs. Board of Education, “separate but equal” was no longer the law of the land and Los Angeles Mayor Norris Poulson ordered the fire chief, John H. Alderson, to integrate the fire department. Firefighting stations in Los Angeles integrated in 1955, and the men of station #30 and the second all black fire station (station #14, established in 1936) were transferred to other stations. There these men faced discrimination, hostility, and second class treatment at their new stations from their white counterparts. Even as physical integration came to fire houses throughout Los Angeles, black firemen nonetheless sought to keep their ties to each other. The fraternal organization of African American firefighters called The Stentorians was founded in 1954 by Arnett Hartsfield Jr. who was a firefighter for fire station #30. The Stentorians are still operating in 2017. A. B. Hartsfield-Mills, The Old Stentorians (Los Angeles: Hartsfield-Mills, 1973); http://www.aaffmuseum.org/.